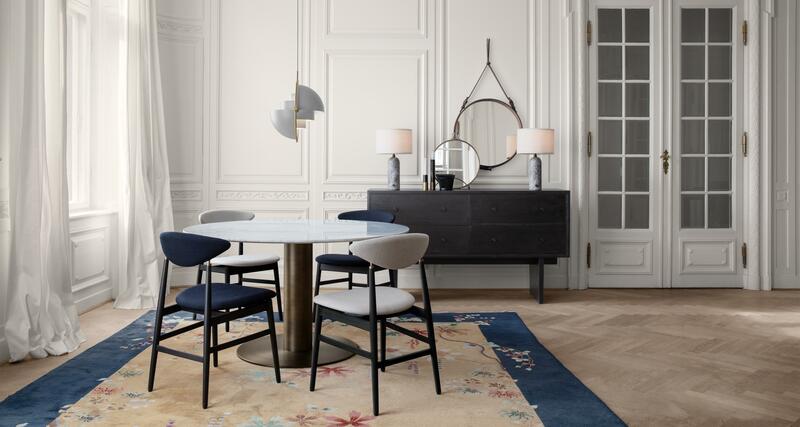 The Gubi Gent Dining Chair is a contradiction between Scandinavian elegance and Italian dynamic lines. A distinctive backrest expresses an almost aggressive masculinity, while at the same time still being gentle and embracing. The Gent Dining Chair possesses a playful balance between formality and whimsy, offering a modern twist on the classic dining chair that evokes an image of the 1950’s. Designed by the design duo GamFratesi. Available with three top cap finishe at same cost. Antique Brass, Dark Antique Brass, Polished Brass. Practical for fitting around the table in both restaurants and private homes. Available in a wide variety of upholstery options.